Family Celebrations play a large part in my family tapestry, and there’s nothing we enjoy more than preparing those special foods that serve as the “icing on the cake” for family traditions. Tomorrow pick and choose as I share my jam packed file full of tradition ideas for Father’s Day, but here’s a sneak peak that fits right in with our Tasty Tuesday Parade of Foods theme. Why don’t you celebrate Dad this week by getting the family together for an interactive and fun cooking adventure? This is one pizza experience your family will never forget because you will name this the “Papa Pizza” to resemble that special man in your life. for hair (if he still has any ;). Use this homemade crust recipe, which is SO easy, or buy a premade one for total simplicity. Each family member will be in charge of placing a different face ingredient on the pizza. When you finish your masterpiece, take a picture of everyone next to it. He’ll never forget how you immortalized his cute mug in such a delicious way. These pizzas are awesome. I want to see some dad be macho when presented with one of these. It'll bring out the kid in them! Those are hysterical and wonderful! What a great idea! Those are SO FUNNY!!!! I have not been around in awhile! I miss your food posts! I have had all day MORNING SICKNESS – Whoo hoo! #3! Too fun! We make birthday pizzas, designing the birthday honoree's age on the pie, but I've not done this one. Cute! How fun! You have to smile. Awesome idea Jen! Thanks! I've been struggling to come up with creative ideas for Father's Day. I know my kids would LOVE putting a pizza like that together, and my hubby would be thrilled. I can't wait to see all of your ideas tomorrow too!! That looks like so much fun, my four boys would love it! I just grilled my first pizzas last weekend, but with a ready made crust, and voila now I just found the recipe for a homemade one. Thanks so much! I LOVE that idea! Sounds like the perfect thing to go make for my father-in-law! What a cute idea! I love how those pizzas turned out! So cute and such fun for the kids! funny pizzas! Our favorite pizzas are the California grilled pizzas from the Barefoot Contessa show on FoodNetwork. Yum! Hey, Jen! I'm stretching today's Tasty Tues. with my homegrown tomato sandwich post. When my kids were small they loved those English Muffin pizzas! The pizzas look darling… must try them! 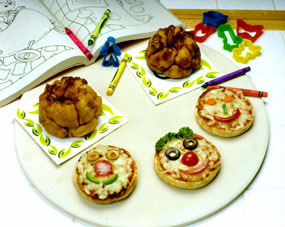 What a great idea for a father's day pizza party! Everyone will have such a great time making them – eating them is special too! Thanks for hosting. I posted something healthy today … Summer Squash Salad. Good motivation to head to the Farmers Market. I love these pizzas and I have also really enjoyed all of your fathers day ideas~thank you!! Great ideas. i love it.thanks for sharing with us . . .